Caroll Shelby, creator of the original Shelby Cobra, unveiled the Ford Shelby GT-H yesterday during the 106th New York International Auto Show. Ford Motor Co., trying to pump up sales of its flagship muscle car, will provide customized Mustang coupes to Hertz Corp.'s rental fleet. This summer, drivers will be able to rent a souped-up Ford Mustang in Hawaii and a few other states. 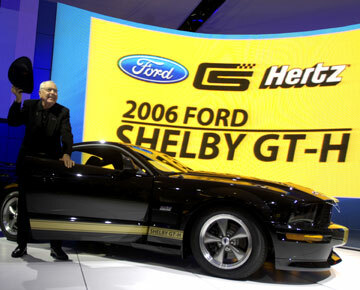 Five hundred 2007 Mustang GTs will be transformed by Shelby Automobiles Inc. into Mustang GT-Hs, then shipped to Hertz locations. The cars, unveiled yesterday at the New York auto show, will have customized suspensions and exhaust systems, and a revamped hood and trunk. Mustang sales declined 3.7 percent in the first quarter, more than a year after Dearborn, Michigan-based Ford introduced a redesigned version. Sales rose 24 percent in 2005, and Ford, the second-largest U.S. automaker, is betting that people who rent cars or see GT-Hs on the road may boost Mustang sales this year. "Ford is going to do everything they can to keep it fresh," said Erich Merkle, an auto analyst at consulting firm IRN Inc. in Grand Rapids, Michigan. He expects Ford to bring out more Mustang "variants." Ford will sell a version of the car it calls the GT/CS, or "California Special," later this year. The GT-H won't be available for retail purchase at Ford's dealerships. Hertz will auction its 500 GT-Hs after they have been driven 16,000 to 18,000 miles. Ford, Shelby and Hertz had a similar rental program in 1966 with "Rent-A-Racer," which allowed auto enthusiasts a chance to drive a Shelby-customized coupe. General Motors Corp., the world's largest automaker, is also hoping to boost sales with new versions of muscle cars that debuted in the 1960s. It may convert its Chevrolet Impala to rear-wheel drive when it brings back another icon, the Camaro, people familiar with the company's plans said this month. Shelby is building the GT-Hs in Las Vegas, where it will add new hoods, air scoops and rear differentials, said Amy Boyland, president of Shelby Automobiles. The GT-H Mustangs will have black-and-gold exteriors, and slightly more horsepower than the regular GTs. "It creates a little buzz in the marketplace," said Robert Parker, car-marketing manager for the automaker's Ford brand. "It helps keep the word out there among enthusiasts." Daily rental rates will be about $125 a day, Hertz spokeswoman Paula Rivera said.